Congratulations on choosing an Android device as your GPS companion. Android devices are at the center of a revolution in low-cost mobile computing giving consumers and hobbyists exciting new tools. When you use your favorite Android GPS navigation application such as Osmand or Google Navigation, wouldn’t you want that additional diagnostic information between turning on your device and getting a GPS lock in? This is where GPSisUp’s role comes in. GPSisUp is a diagnostic tool that uses your GPS radio exclusively and provides feedback related to the strength and reliability of satellite data. Android’s design ensures that once you get a GPS lock in with an application, you can reuse that data in the next application you open. Comparison: You may compare the reliability of GPS hardware across different devices. Research: Compare the stability of a vendor’s GPS driver implementation or chipset. Although we aim for a faster user experience, GPSUp is not an application that will help you achieve a faster satellite lock in. Our software is always a full version and we have no plans to create a premium version. GPSUp does not include any embedded advertisements. 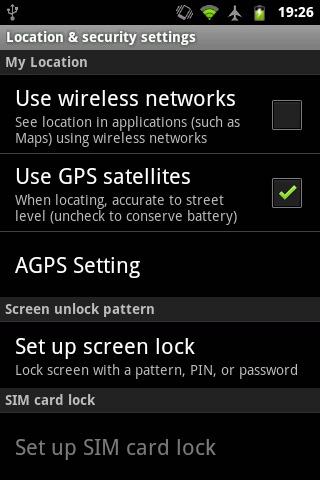 Enabling GPS on your device. Note to Android users of more recent versions: Starting with later Android versions, when you turn on your GPS radio, you will receive a dialog like the following: “Use Google’s Location service?” asking you to Disagree or Agree. It is highly recommended to select ‘Disagree’. What this does is avoid using Google over the web for location reference. After all what GPSIsUp is expected to achieve is to get an accurate diagnostic of only your GPS hardware. Selecting ‘Disagree’ will not affect GPS reception at all. It is a good idea to use a shortcut in case you need to turn on or off your GPS radio constantly. Having it turned on at all times is likely to cause a shorter battery life. If you cannot find the GPS radio switch, the setting is available from your device at Settings->Location and Security -> Use GPS Satellites. The most important factor in getting a clear signal is to be outdoors. Being among tall buildings will cause the signal to bounce off and become less reliable. When GPSisUp starts, it will perform a check for available satellite signals and their strength. Check that the GPS Radio indicator is either yellow or green. A red indicator means that the GPS Radio needs to be enabled (See Enabling GPS On Your Device described previously in this manual. 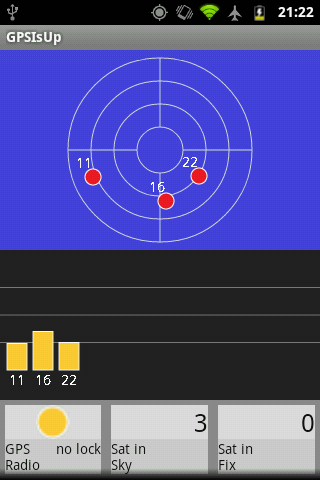 As soon as GPSisUp starts, a list of satellite candidates start to appear as bars on the satellite strength display. -Starting from a cold boot: If your device was turned off completely, your lock-in could take up to several minutes. - Enabling GPS occasionally. The more frequently you use your GPS, the better chances of reusing satellite information stored from previous sessions. - Ability to get signals in all directions. If only a section of the sky is visible, a lock in is possible, but it will take much longer. All informational fields are displayed. GPS is up! A GPS lock in has been achieved. After a lock-in has been achieved, it is time to exit GPSisUp and go back to your favorite GPS application. 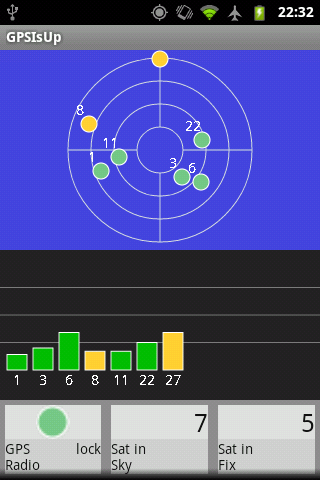 Sat in fix (Satellites in fix): The number of satellite signals that have some level of reliability for a lock in. Heading: This is a measure in degrees of current direction. 0 is north, 90 is east, and so on. Accuracy: A margin of error in meters for the current reading. Consumer GPS radios are not as accurate as ones used for governmental/official use. 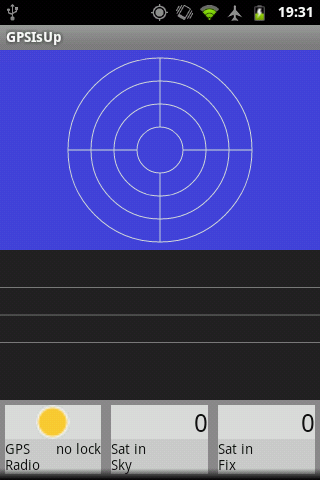 Time to first fix(TTFF): A measure of how quickly a GPS lock in was reached since the screen became active. Depending on conditions, a mean TTFF for a low-end device is about 2 minutes from turning a device on. GPS time: A fairly accurate time received from satellites obtained from atomic clocks. Device time: Your device’s time used for reference purposes.